While the response of much of the world to outbreaks of highly pathogenic avian influenza (primarily H5N1) involves the immediate culling of all infected birds (and all birds in their vicinity), some countries rely instead on a combination of prophylactic poultry vaccination and strategic culling. Politically, and economically, it is easy to see why countries like Indonesia, Egypt, Vietnam, and China prefer to rely on vaccines. Chickens and ducks are often raised in backyard or neighborhood coops, are the main source of protein for many families, and often represent a sizable portion of their wealth as well. Ordering their destruction at the first sign of illness only encourages bird owners to hide or quickly sell their flocks, for fear of losing them entirely. In the past, we’ve seen angry confrontations between culling teams and poultry owners in places like India and Egypt. Whether due to causation or coincidence, countries that rely primarily on a vaccination strategy seem to be the ones experiencing the most persistent bird flu problems. Experts, like Professor C.A. Nidom, of the Institute of Tropical Disease, Airlangga University have warned in the past that the use of avian flu vaccines may only provide partial protection, allowing the virus to spread `silently’ through a flock (see Indonesia: Debate Over Poultry Vaccination). 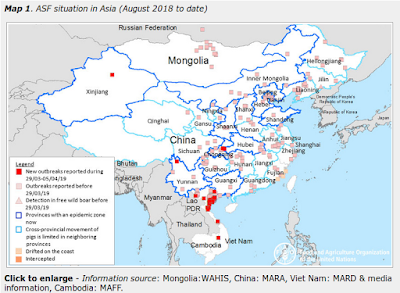 Similar warnings were expressed in early 2009 from Zhong Nanshan, a hero of the SARS outbreak and a highly respected respiratory disease specialist in China, who warned that vaccinated poultry can still become infected with the H5N1 virus. GUANGZHOU, Feb. 6 (Xinhua) -- A leading Chinese expert on respiratory diseases has warned the public to be aware that poultry can be infected with the bird flu virus but show no symptoms. "Special attention should be paid to such animals, including those that have been vaccinated," said Zhong Nanshan. "The existing vaccines can only reduce the amount of virus, rather than totally inactivating it," he said. And for years the OIE (World Organization For Animal Health) has warned that vaccination of poultry cannot be considered a long-term solution to combating the avian flu virus. In Avian influenza and vaccination: what is the scientific recommendation?, the OIE reiterates their strong recommendation that humane culling be employed to control avian influenza, and advising that vaccines should only be used as a temporary measure. While the OIE concedes that some nations may require the use of vaccines for `several years', they strongly urge that countries move away from that program and towards the more conventional culling policy. They call this shift away from vaccines an `Exit Strategy’, a policy which China, Indonesia, Vietnam, and Egypt have shown no moves towards. In the spring of 2010 we began to see reports of poultry vaccine failures in Vietnam due to the spread of a new clade (classified as clade 2.3.2.1), which led to this statement FAO Warns On Bird Flu. With dozens of clades (and variants within clades) of the H5N1 virus in circulation, it is not surprising that vaccines that have been in use for several years are no longer protective. Which brings us to a new study – conducted by the Virology department at St. Jude Children’s Research Hospital - appearing in the journal Poultry Science, that looks at the effectiveness of six commercially available H5 poultry vaccines currently deployed in Egypt. Of the 6 vaccines tested, only one (based on a locally acquired H5N1 seed virus) actually appears to offer protection. Poult Sci. 2013 Jan;92(1):114-8. doi: 10.3382/ps.2012-02637. Do commercial avian influenza H5 vaccines induce cross-reactive antibodies against contemporary H5N1 viruses in Egypt? Kayali G, Kandeil A, El-Shesheny R, Kayed AS, Gomaa MR, Kutkat MA, Debeauchamp J, McKenzie PP, Webster RG, Webby RJ, Ali MA. After emerging in Egypt in 2006, highly pathogenic avian influenza H5N1 viruses continued to cause outbreaks in Egyptian poultry and sporadic human infections. The strategy used by Egyptian authorities relied on vaccinating poultry, depopulating infected areas, and increasing awareness and biosecurity levels. Despite those efforts, H5N1 became endemic, and vaccine-escape variants are thought to have emerged even though commercial poultry vaccines were protective in laboratory settings. We studied the cross-reactivity of 6 commercially available H5 poultry vaccines against recent H5N1 Egyptian isolates in a field setting in Egypt. Only one vaccine based on an Egyptian H5N1 virus induced high cross-reactive antibody titers. Our results may be explained by the fact that the seed viruses in these vaccines are genetically distinct from H5N1 viruses currently circulating in Egypt. In light of our findings, we recommend that the H5N1 prevention and control strategy in Egypt be updated and reinforced. Special consideration should be given to the vaccination strategy, and the use of vaccines based on currently circulating viruses is advisable. The problem of mismatched poultry vaccines isn’t specific to Egypt, of course. Recently Hong Kong announced their intention to upgrade their existing vaccine (see New poultry vaccine to be introduced) by the end of 2012. Similarly, Vietnam is now testing a new H5N1 vaccine against the emerging 2.3.2.1 clade of the virus. And over the past few weeks we’ve seen multiple reports of poultry (mostly duck) die offs in Indonesia (see VOA Report On The Indonesian Duck Die Off), concurrent with the recent arrival of clade 2.3.2.1, suggesting their vaccine may be faltering as well. The debate over the merits of culling verses vaccination continues, but one point seems clear. For a poultry vaccination program to work, the vaccine must closely match the viruses locally in circulation. Otherwise, the use of poorly matched vaccines has the potential to merely mask signs of infection in a flock, enabling the virus to spread silently, and possibly mutate further.